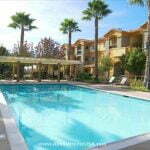 Located in the Sunbow community of Chula Vista, these Chula Vista furnished apartments cover over 14 acres. Shopping and restaurants are within walking distance, and . . . Located minutes from the Pacific Ocean, these Chula Vista corporate apartments offer graceful hilltop living, overlooking beautiful Otay Ranch, and are a couple of blocks . . .
We serve the entire Chula Vista area including San Diego, Coronado, La Jolla, and San Marcos. Almost Home offers some outstanding Chula Vista corporate housing options. Every one of our furnished apartments are individually suited to whatever needs our clients have, from the corporate traveler to those who are relocating to the area and require a short-term Chula Vista furnished apartment while they search for a home to purchase. If you are considering a move to the Chula Vista area, perhaps a little area information would be helpful for you to peruse. The beauty and majesty of the geography and the climate in this place lends credibility to the meaning of its name--"beautiful view." The weather here is balanced by the combined effects of the Pacific Ocean and the mountains that moderate the winters and cools the summers resulting in a very temperate climate. Summers here stretch from May to November where the highs over in the low to mid 70s and the rest of the months the highs don't go beyond the high 60s. Culture and climate dictate casual and light dressing in Chula Vista. In addition to the balmy climate, the culture is inviting as well. The influence of the Spanish heritage is undeniable in everything here, and it is something you will begin to appreciate as you spend your time here. From time to time, you might want to step out of your Chula Vista corporate apartment enjoy some great dining experiences. La Querencia on Broadway: This is something you will not find in most parts of the country. They cater to almost anything Mexican you could be in the mood for. Give in to your gustatory desires with the coconut shrimp and tempura salmon on the appetizer menu; and then move on to the main course with Margherita Flatbread and Fish Tacos. Mangia Italiano on Third Ave.: When you're in Chula Vista, this is one restaurant you absolutely cannot miss. The appetizers kick off a great experience with items like Bruschetta Alla Toscana and Seafood chowder. For the main course, the Veal Piccata, Shrimp Scampi, and Fettucine Pesscato are good choices. Kanpai Japanese Restaurant on Palomar St: If you like Japanese cuisine, then this is going to be your new favorite haunt. The chefs put on a good show and the time flies as you keep filling up your plate. The Unagi here is simply divine, as is the Sea Urchin, Dragon Roll, and Caterpillar Roll. Royal India on Market St: If you have a palette for Indian cuisine, this would be a good choice. Try the Samosa and Sev Poori. Performing Arts: There is a lot of culture to enjoy in Chula Vista, especially amidst the various performing arts. There will always be entertainment for you to enjoy here, and to appreciate while taking up a Chino Hills temporary housing residence. Pay a visit to the OnStage Playhouse on 3rd Ave. There is also Sleep Train Amphitheatre on Entertainment Cir. Malls: There are a couple decent malls in Chula Vista: the Otay Ranch Town Center on Birch Road and the Chula Vista Center on Broadway. Most of the national brands are represented here, and of course there is more than sufficient food and entertainment outlets here as well. Golf: There are a number of golf courses across California. Some of them are right here in Chula Vista like Chula Vista Golf Course, located on Bonita Rd. Also, you might want to check out the National City Golf Course on Sweetwater Rd or the Coronado Golf Course on Visalia Row. Parks and Recreation: California offers some of the best parks and recreation facilities in the nation. They manage nature trails and aquatic centers for the community. At any one of these parks you can swim, play tennis and hike. All this is managed by the Chula Vista Parks & Rec. Commission. There are even numerous picnic sites around Chula Vista that you could spend the evening walking your dog or just running to work up a sweat before hitting one of the really good restaurants downtown. The time you spend in Chula Vista will be something that won't be easily forgotten. There are just too many things that will conjure memories of good times of food, recreation and the glorious views and scenes. Wherever your corporate housing in Chula Vista is located, make sure you drive out and explore this awesome city.